Next Monday, the European-Atlantic Group is organising a debate in the Grand Committee of the House of Commons, on what it will take for Europe and the world to return to growth and end the Crisis which began in 2008. Where: Grand Committee Room, The House of Commons, London. Visitors are asked to use the St Stephen’s Entrance and to allow 30 minutes to complete the security formalities before proceeding to The Grand Committee Room). Although there will be no charge for this event, please confirm your attendance by emailing the E-AG ([email protected]) stating your name, your organisation and that of your guest together with the relevant contact details. Almost five years after the Wall Street Crash and the global economy has yet to recover. While the financial system was saved from collapse, even at the eleventh hour, the developed world remains in the doldrums of a vicious recession and the emerging nations are buffeted by uncertainty blowing in their direction. Europe’s conundrum is particularly taxing. Last month, the President of the European Central Bank (ECB) issued the unprecedented warning that the Eurozone was at an advanced process of disintegration. His programme of unspecified bond purchases, while bold and a significant step for the ECB, is unlikely to resolve the crisis. So which way forward? Professor Marcus Miller and Professor Yanis Varoufakis, will address this issue by focusing on a crucial ingredient of the international economic system that has been missing since the 2008 Crash, i.e. a global surplus recycling mechanism to explain why the global economy is failing to regain its poise. Professor Miller has been Chair of the Academic Panel of the Treasury, Economist at the Bank of England, and Economic Consultant/Visiting Fellow at the IMF, World Bank, OECD and ECB. He gives lectures on the global economic system at the LSE and international conferences and has recently cooperated with the Independent Commission on Banking. Educated at Oxford University (PPE) and Yale University (PhD), he held an academic position at the LSE and visiting positions at Princeton University and Chicago University Business School. Professor Varoufakis regularly talks to global media (CNN, Bloomberg, BBC, Sky News, etc.) and has counselled the New York Federal Reserve, Columbia University and the Institute of New Economic Thinking (INET). In 2010, Professor Varoufakis and former British MP Stuart Holland jointly published “A Modest Proposal for Overcoming the Euro Crisis” which Yanis presented at the INET’s global conference in Berlin. He received a PhD from Essex University and held academic appointments at Cambridge University and the University of Sydney. These critical issues of the global financial and monetary system together with constructive suggestions will be of interest to diplomats, legislators, academics, economists, media and all those who have a responsibility for these matters. I shall be at the House of Commons as also at the dinner afterwards; see you there. The concept of a global recycling mechanism is utterly flawed. In essence, at the absolute root of this concept is the following. You are expecting businesses in one country to subsidise consumers in another country so they can by their products. In effect the global recycling mechanism is forcing companies in certain countries, Germany for example, to sell products to other consumers in other countries, the UK for example, at a lower price than they would be in Germany. Why a lower price? Because you are asking German companies to refund the consumers in the UK through the transfer of tax revenue. This will lead to German companies having to charge more for their products in order to maintain profit margins leading to less exports from Germany to the UK. This may sound good but I think you will agree that there is not a snow flakes chance in hell that any government will reduce taxation on its citizens when the level of exports inevitably drop. I have yet to see a government reducing taxes in the last 20 years. In short a recycling mechanism will be hopelessly unresponsive and inefficient to variations in trade balances between countries not to mention punishing companies for offering superior products or services. The more successful they become they higher the taxes they will have to pay cancelling out any improvements in the product of service. If I can also bring back your use of the United States as an example of a recycling mechanism. You are missing, and I missed, a crucial flaw in your example. When you talk of the federal government in the USA recycling taxes, they are recycling *Federal Taxes*. Taxes collected by the Federal government. At the moment there is no federal European taxes. At least not explicitly. Are you proposing that people in Europe start paying an extra federal European income tax? If so this is even more inefficient and unresponsive than taxes raised at a state level. And this would have to increase the total tax burden on Europeans as there is zero sign of any government in the EU reducing taxes at the moment, the very opposite. I have no doubt the recycling mechanism will distribute the wealth more evenly but at the cost of having everyone living at a lower level. Richard, I think you need to look at the Data posted in the link carefully to see that we need more German and Japanese machinery to fight the Minotaur…. And Greece can’t make enough Galaktoboureko to fix it. Which proves at least thing- that the Global Minotaur is going to be taught in Harvard / Yale at some point. Paradis – Which link are you referring to? The zerohedge link? if so I don’t see the link between it and the recycling mechanism. About the “global” surplus recycling mechanism being broken. What recycling mechanism? It doesn’t exist and never has done. I am not sure what evidence you have that supports the existence of one? If you refer to Chinese holding US government debt this is not a recycling mechanism. The Chinese rightly or wrongly expect to get that money back at some point or at least make money of the yield. The are not doing it for recycling purposes they are doing it to make a profit. They are not “giving” money to the USA out of pity. “And Greece can’t make enough Galaktoboureko to fix it.” – Are you saying places like Singapore and Hong Kong (and I think I am even comfortable in saying Japan and Germany) have more things going for them than Greece? If so what things? Richard- The Article is one of many proofs that are out there if you are looking for real-world data that highlights the failure of this mechanism to respond to the shocks coming forth from the economy. The odd thing I can’t quite understand is as to why you are on this website if you don’t even understand for example exchange between countries in FX swaps as part of their monetary policy? And those effects are nothing more than levers on TOP of the global surplus recycling mechanism. i.e Yanis pointed to something under the hood, not an illusory object! It’s the classic naive hypothesis – You think because you know how to run the household budget, so you’d use that logic to hold hostage any understanding of complex money flows which are on an entirely differnet plain than household budget type thinking. So because of that you think you can somehow disregard the reality of complex macro strategies being engaged by countries across the global? Did I miss something? Paradis – Thanks for the clarification on your point. Yes, you missed something. If I can clarify for you. Zerohedge, (ie the source of the article that you wrote) does not believe in a recycling mechanism it also does not believe in macroeconomics. in a more direct way. I would recommend you read Zero Hedge in more detail and also the “Zero Hedge Reads” at the bottom left. They arent giving money to the US at all.The US government as the monopoly issuer of government money does not need anyone to finance its spending.Bond issuances are used to drain excess reserves from the banking sector and provide an interest bearing asset to the private sector. China has a trade surplus against US,in other words it is a net saver of the US currency.They could decide to not buy bonds and keep the money as a demand deposit at the FED…but it wouldnt make sense when they can put that money in a time deposit (which is what a bond really is) and earn interest on that.They could ofcourse choose to sell their dollars for other currencies but this would cause the dollar to depreciate and make the chinese products more expensive.They dont want that, do they…? I would add that Chinese companies are snapping up raw materials around the world which is driving inflation worldwide. China is not saving it all. Yanis, the text is (partially) copied twice. After Coke will leave the Greek stock market will be demoted to third world status. Looks liek the EU bailout plans are workinf out well! Welsh – More evidence if it were needed that the Greek government does not give a stuff about the Greek economy. Its all about seperating Greeks from their savings. The Brits will have a hard enough time holding on to middle America when this stuff really blows up , the cultural gulf between the Germans & perhaps the French will be just too much – especially when they realize that the EU has served as the early 20th century India to the modern UK market state. Enough is enough , Ireland is of course lost but some other places can be saved. “Let﻿ me tell you this, eagle creep! You have misplaced your patronage of the European-Atlantic Group. Administratively they have proved themselves hugely inefficient. Following your notification to us, I tried to apply for entry for two people by several e-mails and a telephone call. All proved fruitless. I was finally phoned today to be told that the occasion was over-subscribed. My application of many, many days ago was overlooked because the Greek chap who was meant to be supervising the show had his attention taken by ‘other’ matters. I am suspicious that entry was restricted to members of the E-A Group and Greek friends of the supervisor. I am disappointed and suggest that in future you direct your appearance to locations where the public can easily gain admittance. Perhaps the Albert Hall as I have previously suggested to you in person? Harry the Horse, if you have already mailed your intention to attend the House of Commons, you are already on the list to attend. That was merely so that the House of Commons would be forewarned of who was attending. Security at the House of Commons is VERY strict. If you did so twice, it is likely that you are on the list twice. Tourists, boycott Greece and let it die in its cesspool of Golden Dawn hate. If you are black, brown Jewish, or gay, your life or immediate well being is at stake, additionally. So are you saying “tourists, do not go to Paris” too? The cess pool exists in all nations and waits for the right conditions to become inflated. And the right conditions are inflation, unemployement, hopelessness. The cure is not in boycotting a country with a rise in hate parties, whether on the far right or the far left, but in helping solve the problems that produce this rise. Fortunately not many EU politicians have your attitude. Anna V is correct; the only way forward is through the creation of jobs, millions of them. It is also important to remember that this is NOT just a Greek problem, for example the US is facing exactly the same problem with a lack of jobs; it is just that they have been systematically covering up the truth of it. (Above taken from page 4 inside ii by Michael Peltz, Editor, September 2012). Unlike in the past, when the likes of Bernanke would always feel they had the situation under control; this time they know for certain that they do not have it under control. It is thus imperative that those with solutions step forward strongly and press for their use. Which is why I shall be there this evening. Do you have the same to say for all those other countries who have racist political parties.For example,do you also bestow your deathwish on the French due to the Front National,and the Dutch due to Geert Wilders? A party that gets 7% hardly characterizes a whole nation.Your comment is unfair. I suspect you will block this, but a lot of people are losing sympathy for Greece because of the electorate’s rapidly expanding support of Golden Dawn. Yes, the country was screwed by bigger powers, but in reaction it looks like a very substantial part of the population is easily attracted to something much worse. Why would I block it? As a Greek I feel deeply ashamed for the rise of Golden Dawn. But I urge you not to slide into their own type of generalisation. Don’t forget that we Greeks were the ‘brown’ people in Australia, Germany, Canada etc. where we migrated as economic refugees in the 50s and 60s. Millions of Greeks took menial jobs then. And millions are begging for menial jobs, in Greece, today. Since the day (today) is a memorial day for Greece of the WW-2, let’s remember some things (and especially, remember what some “civilized” nations did to humans *). * The blame is not only to the mad leaders but also to the people of those “civilized” nations. Because, not only they followed the mad plans -without any substantial resistance- but also, because a great majority of them participated in the war crimes. PS Question: did they pay for the mess they made? invoking the usual scarecrows (“we will be thrown out of the euro, we won’t be able to pay pensions and salaries, etc.etc), the government is “forced” to comply to the troika’s latest demand, of “unfreezing” foreclosures for non-performing mortgage loans, throwing (or threatening to do so) approx. 300.000 families out of their homes. Note that many of these are families with no income for months, surviving on the charity of their relatives, the church, or whoever. At that point, Golden Dawn announces that it will form “patriotic anti-foreclosure squads” that threaten with serious violence against the sheriffs who attempt to enforce the foreclosures (we don’t call them sheriffs in Greece, but it will do). If this, not unlikely, scenario occurs, many sheriffs will try their damnedest to stall foreclosures; some will do it out of sympathy for the unfortunate families, not because they are intimidated by Golden Dawn, although certainly some will be intimidated. No matter what, the polls for Golden Dawn will go through the roof, and several thousands will be recruited in the “squads”. VSS – The link you give. It is based on an assumption that is not exclusive to Greece. The “observation” could quite easily be applied to the USA with the same results re “liar loans”. In short, it is an interesting perspective but Greece needs to be compared with the USA to asses the real world effects of their “observation” in relation to tax avoidance. If you know what I mean? what about your sympathy towards the German Government.You only (rightfully) complain about not being asked about the money.But need i remind you that Germany first pushed for Papademos to be a prime minister and then pushed for a ND-Pasok coalition? Did this in your opinion help us “abandon the ruling plutocracy.” ? You use the same rhetoric as the German government, yet their own actions contradict with such a rhetoric. Was that so? Even if, as far as I know, the Greek governments are elected not by Germans but by the Greeks themselves. Do you have other informations? Crossover, when will you ever accept that foreingers played minor part, if at all, to bring Greece to the state where she now is. For instance the bribery by foreing companies like Siemens, Alcatel and so on: if there wouldn’t have been already a culture of bribery deeply rooted in the Greek system, they would have had no possibility to bribe Greeks. No? Come on, there MUST be something Greece herself is responsibel for! I have to remind you that Papademos was not elected.Just like Monti, he was appointed.Coincidentially (?) both of them played a role in cooking their respective countries’ statistics to enter the eurozone.Wasnt your government acting like the fooled victim that had no idea? Im trying to find a reason why would they prefer these 2 if they were supposed to be against them and their deeds? As for the current coalition government, ofcourse it was elected from the Greek people.But do you seriously believe it was an unbiased choice when during the pre-election period (and even now) Syriza, the main opposition was being framed both in Greece and outside as “drachma lovers” and German officials were calling for the “correct choice” that would keep Greece inside the Euro?Seriously? You mean to tell me that was unbiased? If you want to blame the Greek people for believing in this scare mongering once again, thats fine, i agree and i say the same thing.But this doesnt mean that Germany didnt play her role over the outcome. About siemens, not long ago Siemens was sued for similar scandals in the US.So according to you this must mean that the same culture of bribery exists in the US. Great work as always. I do have a rather basic question in regard to the SRM though. How do you square the SRM concept with the broader idea of global savings glut a la Bernanke? Claudio Borio and Piti Disyatat have a paper BIS paper that seems to find no link between imbalances and crises. However, they are concerned with gross inflows for example and not merely “net” measures….which is defined as a global banking glut elsewhere (on Naked Capitalism blog for example). Is this what you have in mind with the SRM concept? It is precisely the same thing in different wrapping. “Fraud. Why the great recession” . As Bruno Leoni says “even those economists who have most brilliantly defended the free market against the interference of the authorities have usually neglected the parallel consideration that no free market is really compatible with a law-making process centralized by the authorities”. Iulia – “”even those economists who have most brilliantly defended the free market against the interference of the authorities have usually neglected the parallel consideration that no free market is really compatible with a law-making process centralized by the authorities” – and the video link – which side are you on? You should take that quote plain and simple as a connection between the free market and the philosophical idea of law. Iulia – You agree with the video or on the quote? A snappy tune and some fun to send back to worried family is a welcome distraction from the heavyweight points we keep on placing up on the likes of Yanis’ web site; so I have no problem with the tune and video. Mises, Hayek and Rothbard, were among these “ones” who were striking at the root. Each of these great Austrian economists eventually came to the conclusion that the weaknesses in our modern banking systems cannot be solved merely by a return to the gold standard. This has already been tried. As long as governments control money they will find ways to pervert it – be it gold or paper. The only true solution to our monetary woes is to take the monopoly on the creation of legal tender out of the self interested hands of government and allow the impartial invisible hand of the free market to once again provide stable money. Only under these conditions could any durable return to the gold standard possibly succeed – only if it were left to a free market. Im sorry but in the eurozone, governments dont have money issuance abilities.When they need to spend more than what they can tax they have to compete with households and corporations in the open market for credit.Did this help to avoid banking problems? Who managed their banking crisis better? The US government that is the monopoly issuer of USD or the eurozone? Your short religious answer is a great example of the trouble with the completely unjustified fanatical following that economic theories have. All economic theories. If you take into account that all of them are inherently scientifically flawed you have a complete picture of the intellectual mess this extremely interesting but by no means scientific field finds itself into. “If people rush out to buy bottled water and canned goods, that will actually boost the economy.” – Krugman, giving the standard Keynesian line that destroying wealth somehow produces wealth. Of course, we know that war is not good for the economy, and printing money doesn’t “stimulate” anything but the paper industry. P.S. Yanis, please excuse me for exceedingly posting. is this what you call paper industry stimulation? I’d love to hear an explanation about what im seeing on these graphs…unless im cross-eyed or something…. Excuse me ! But who are you to lecture me? Yanis is the only one entitled to do that ! [..] If you agree with the video then even open market operations must look inflationary to you (which is obviously wrong) or you believe that too much of these open market operations will cause inflation.(e.q.) And stop making assumptions on my behalf ! Btw, you’re trying too hard. VITA BREVIS EST. Economic theories are not based on any known scientific principle whatsoever. Their “models” are gross oversimplifications at best. Any hard science student would laugh out loud at things that pass as scientific truth and expressed through mathematical models while being preached to the masses through economic textbooks. I have read the book you have suggested and I consider myself an admirer of the Austrian school of economics. I prefer Schubeter’s views than Hayek’s though; his are closer to human nature. I am 100% sure that Schubetter and Hayek would agree with me that the level of influence of economic theories on policy formation is unhealthy and has led to misery for both society and economics. Your postings on Krugman are very interesting. I do not consider myself a “Keynsian” for whatever that means. Somehow that one always pops up whenever I challenge the validity of economic theory, usually the neo-classical model, wonder what it means.. Keynes was brilliant as well but his theories are equally scientifically flawed along with everyone else’s. It is great work and with real elements of truth but not scientific knowledge in any way. Your snipe at the “Nobel Prize” for economics is dead on the money for me. It is hybris to put Nobel’s name next to a prize for economics.. The FED has very few tools to help the real economy.Fiscal policy is way more effective regarding economy stimulus.And thats exactly what my link shows.It shows the effect of fiscal stimulus not QE and by the way i’ve yet to understand how QE is harming the rest of the world. I wonder why the Japanese that did QE years before the Fed didnt cause chaos. The youtube video you posted is nonesense. 1)They claim that deflation is good (??????? ).How good can it be when the private sector is trying hard to deleverage and deflation makes the debt burden larger?Is that likely to promote growth? 2)”They print the money and then they buy the Treasury bonds”. Are you familiar with how central banks conduct their policy regarding maintaining their desired interest rate?Simply by controlling the price of reserves existing in the banking system in aggregate.How they do that?By buying and selling Treasury Bonds.When they want to lower interest rates they buy treasury bonds in exchange for reserves.This causes the price of reserves to drop.They do the opposite when they want to raise the rates.Thats an open market operation.QE is exactly the same thing only exaggerated.They flood the banking system with reserves. 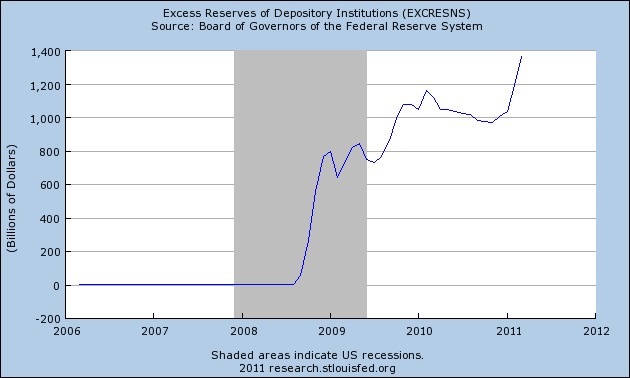 To make a long story short, the Fed has the unlimited ability to issue reserves.You can call it “printing money” but reserves dont enter circulation so you cant seriously claim this type of “printing money” is inflationary.It is argued that QE causes asset price inflation but on the other hand the fed gives an almost zero interest bearing asset (reserves), and takes from the economy an interest bearing assset (the bonds) so any inflationary pressure of this sort is offset by this more or less. Nobody.And im not lecturing you.Im just disagreeing with the nonesensical video you posted. QE is no different from an open market operation.Period.If QE is inflationary then open market operations must be inflationary too.And the video claims exactly that.The only assumption i made is that you agree with what you posted.If you dont, then forgive me but why did you post it anyway then.